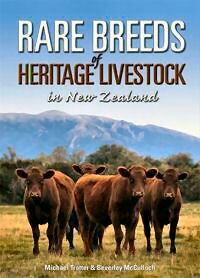 This book is about the rare breeds of heritage livestock that are found in New Zealand. Many of these are so reduced in numbers that their future now hangs in the balance. Each was brought into the country, or developed here, before 1950 and has been here continuously ever since, but their numbers are now so low that they must be considered rare if not endangered. If they are allowed to die out, our options for future livestock needs will be drastically reduced. The call to conserve rare breeds is all the more important these days when the threat of climatic change leaves us with an uncertain future. See Dr Clive Dalton's review of this book. Now available directly from the Rare Breeds Conservation Society for $NZ45, including postage within New Zealand (overseas postage at cost). $10 discount for members of the Rare Breeds Conservation Society of New Zealand. Orders to editor[at]rarebreeds.co.nz (replace [at] with @). All profits go to the Rare Breeds Conservation Society of New Zealand.